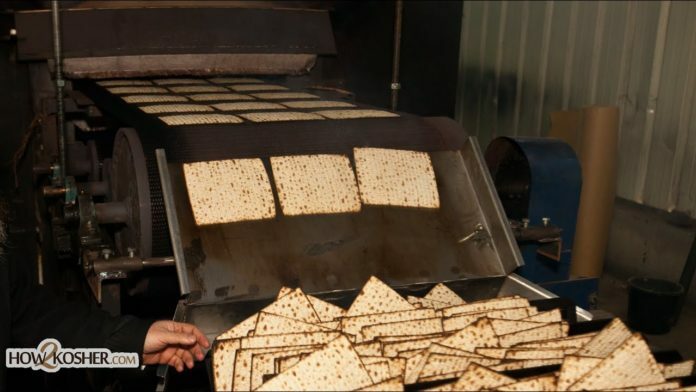 Join us as we explore how gluten-free kosher machine-made matzos are baked for Pesach. It all starts with the factory preparation to ensure a gluten free working environment – gloves, gowns, and the whole works. Once the place is fully scrubbed, the dough preparation starts. Complicated as the timing is for regular matzos to meet the 18-minute mix-to-bake limit, creating viable dough with ingredients such as spelt and oats is an exact science requiring precise measurements, not to mention the highest level shmura kashrut standards for Pesach. After coming out of the oven, the matzohs are individually examined, sorted, and packed for shipment after passing through the weigh station. From the article above and from the video, I fail to see anything special about gluten free matzos. In any event, the machines, as well as gloves and aprons are changed in between runs. This is standard practice for many mehadrin bakeries. This is especially true with the matza bakery in the video. I recognize it, as i have baked there many times. Additionally, you write that precise measurements of flour and water are required for the gluten free product. This is true whenever one makes matzah. If the flour-water ratio is off, the dough is hard to work with. Bekitzur, everything that you write in the article and show in the video applys equally to regular shemurah matzah as well as the gluten free variety. Spoiler alert……same process as all other machine matzah, just a different type of flour.